It really is very difficult to define everything that concerns electrostimulation, but what is easy is to talk about our four fundamental pillars. Advanced state-of-the-art EMS training system that exercises 350 muscles simultaneously. Information on physiological parameters such as heart rate, Kcal. Consumed and training zones during the exercise. Track and train with different levels and more than 250 exercises that make the client more independent. The only system that sends results reports automatically to the client with the data of the training performed. EMS Revolution is a new concept of integral equipment for SPORTS CENTERS and PERSONAL TRAINERS, with physiological parameter monitoring software and virtual trainer. The Advanced Integral Electro Stimulation Device. It allows different workouts and intensities. It is a quick and easy to use device. The objective is to optimize and facilitate the role of face-to-face staff. Suit or garment of Advanced Intensive Electro Stimulation. Highlights: hygiene, ease of washing, ease of use, ergonomics, strength and elasticity. This is a monkey in a single piece of neoprene with 20 electrodes inside. Software of measurement of Physiological Parameters in Live.. Information is collected on different physiological parameters such as Kcal consumed, heart rate, maximum heart rate%, intensity zones and training effect. The client automatically receives in their email the results of the training performed. REAL-TIME MONITORING In order to perform EMS monitoring in real time, the user must wear the pulsometer and the electrostimulation vest, with the possibility of adding personal physiological data to increase the accuracy of the evaluations. 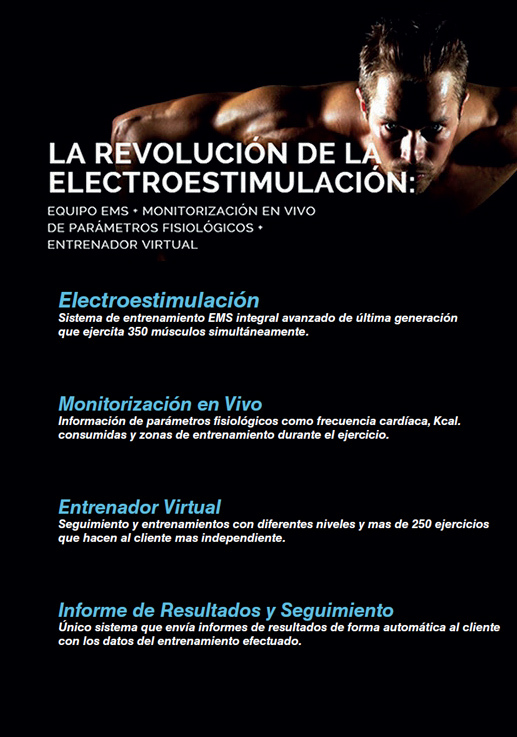 Software with specific Virtual Trainer of Electro Stimulation.. Virtual trainer with more than 200 exercises videos to do. Thanks to the help of the virtual trainer, users can use electrostimulation in a safe way with visible results in a few sessions. In this way it would be possible to train several people at the same time with a single coach. 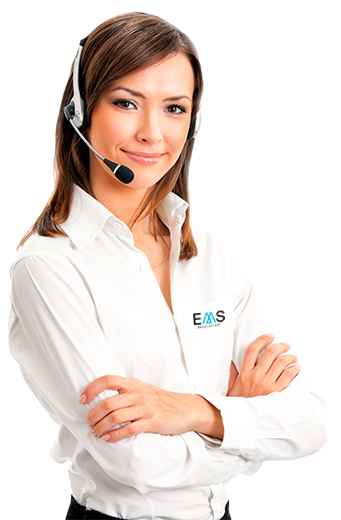 The objective data collection and training optimization offered by the exclusive EMS Revolution monitoring software will facilitate customer loyalty. The most attractive thing for the client is to know how many Kcal. Have been consumed after performing the exercise; The localized training zones and the percentage in each of them. This type of technology will give your center a more objective and attractive aspect, clearly differentiating yourself from the competition by offering a 100% effective product. The only system that sends results reports automatically to the client with the training data made. Ready for the electrostimulation revolution? What is Virtual 360 Fit?